It’s the king of dip. Yes, you heard that right, in both taste and versatility. It’s a healthy companion for your chips or veggies. Full of fiber and chickpeas goodness, it’s our must haves on any given days. What do you need for a good hummus anyway, couple ingredients and the recipe, whoa, done. I guess that’s not enough, if you read my post you will know it all. It’s a journey to the perfection, very interesting findings on the way here. Hope you enjoy as much as I did. After literally going through tubs of these, creamy, classic, flavored, organic, you name it and we had them all, finally I decided to make it at home. The trigger was jalapeno cilantro hummus from Trader Joe’s and our longing for it, smile. I am not against store-bought food items, I like some of these myself, it’s just that sometimes it makes me think; will it be better if its homemade and knowing what goes in to it, freshest of ingredients used, the answer comes down to little extra efforts and lots of satisfaction. 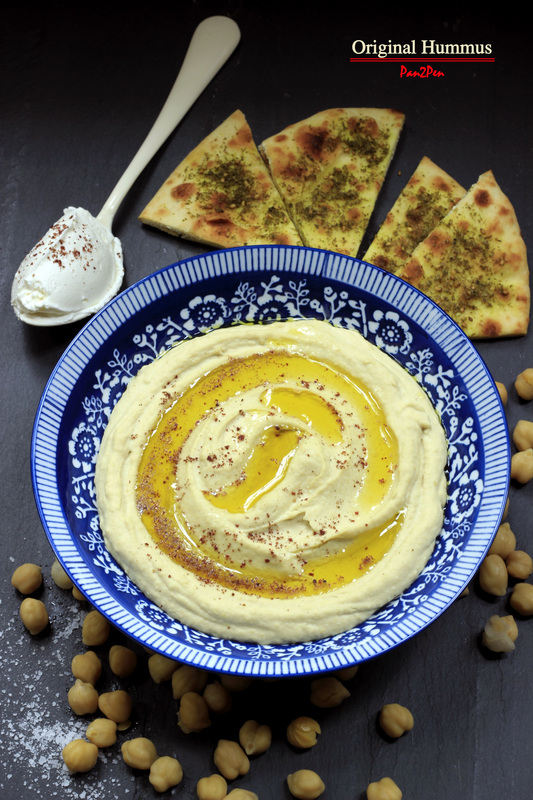 This recipe is adopted and modified version of two best recipes available, smitten kitchen’s ethereally smooth hummus and best hummus recipe by humus101. I can taste the deliciousness of your hummus from your photographs, its looks that good Deb Perelman from Smitten Kitchen. You eexplained well going extra mile in removing the chickpeas skin to get utterly smooth hummus. I can see that through the photographs. I even love the idea of making peace with the technique in pealing the chickpeas and daydreaming. Still, I just couldn’t do it and went on and used skin intact but well cooked (Read not over cooked) chickpeas for my classic hummus. 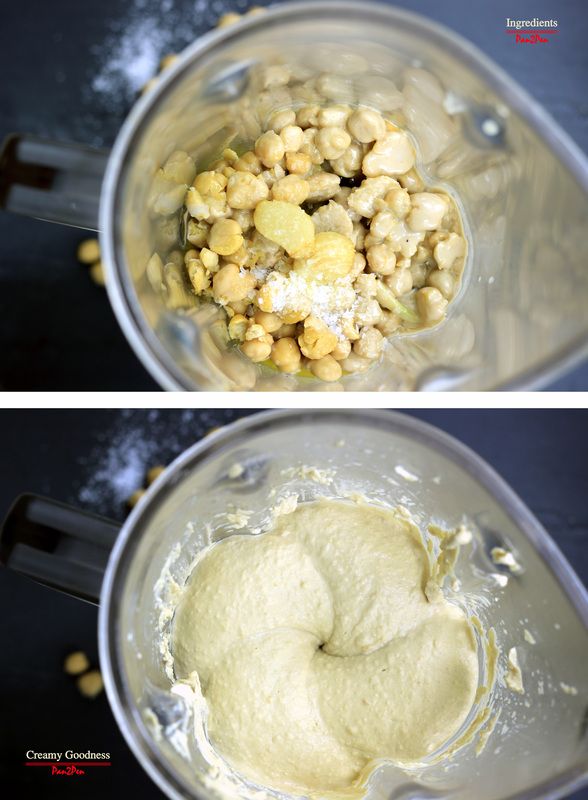 And let me admit this, hands down, peel the chickpeas if you want smooth, buttery hummus, period. If you don’t mind it being just a tad bit grainy go right ahead and use it with the skin on and save yourself sometime. Another step in making good hummus explained by Shooky Galili, “The Hummus Guy” from humus101 blog, a journalist and blogger from Israel and technique tested in my kitchen; don’t skimp on home cooked chickpeas over convenience of canned. Check out details, it is very informative and affirmative blog. I have tried making hummus with both kind of chickpeas, canned and dry and definitely taste the difference between two and you guessed it right it was enough difference for me that I choose to become a dry chickpeas advocate. All I did was soak my chickpeas night before and pressures cook it next morning while I was preparing my tea. Well, technically I did not use any extra time out of my over scheduled day if you are thinking about the extra time that goes in doing it from scratch. You can even cook extra cup of chickpeas and use it to prepare Chole (famous Indian chickpeas curry) or toss it over salad as added bonus. Speaking of Chole, I have a perfect semi-homemade 10 minute cooking recipe but that I will share sometime later.